U.S. Democratic presidential candidate Barack Obama voiced his support for the Treasury Department's imminent move to aid ailing financial institutions, even as his Republican counterpart, John McCain, said the Federal Reserve needs to stay away from bailouts. Democratic presidential candidate Barack Obama, seen at a rally Friday in Coral Gables, Fla., voiced support for a U.S. Treasury plan to stabilize credit markets. 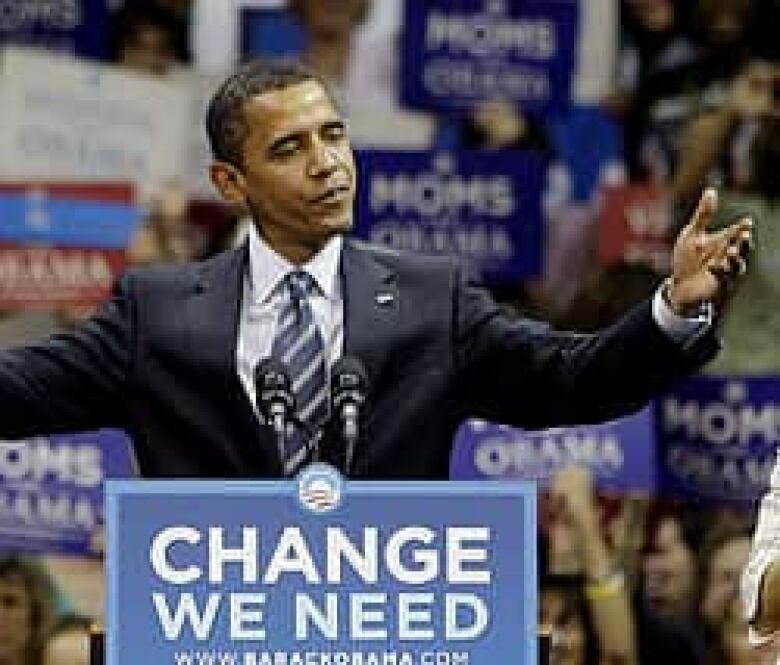 ((Lynne Sladky/Associated Press))U.S. Democratic presidential candidate Barack Obama voiced his support for the Treasury Department's imminent move to aid ailing financial institutions, even as his Republican counterpart, John McCain, said the Federal Reserve needs to stay away from bailouts. Obama told reporters at a news conference in Florida that he welcomed U.S. Treasury Secretary Henry Paulson's plan to intervene in the credit crisis, adding he should be given "broad authority" to fix the problem. Republican nominee McCain, speaking to business leaders in Green Bay, Wis., did not mention Paulson's plan specifically, but said the Federal Reserve should focus on strengthening the dollar and managing inflation. Earlier this week, the U.S. Federal Reserve engineered an $85-billion US takeover of insurance giant AIG, the failure of which was the latest of a series of collapses of major financial companies that has rocked Wall Street. Once-venerable investment banks Bear Stearns, Lehman Brothers and Merrill Lynch have all been bought out or filed for bankruptcy. The government also seized control of housing giants Freddie Mac and Fannie Mae earlier this month. President George W. Bush said Friday that extensive federal intervention in financial markets was both warranted and essential to halt the worst financial crisis in decades and that the risk "of not acting would be far higher." Paulson told journalists on Friday that a successful bailout could cost "hundreds of billions" and "must be finely designed and sufficiently large to have maximum impact." Obama did not deliver specifics of his own proposals to alleviate financial unrest for fear of roiling world markets. "What we have to do is make sure taxpayer money is not being used to bail out bad decisions," he said. He did not put a price tag on a bailout he could support. 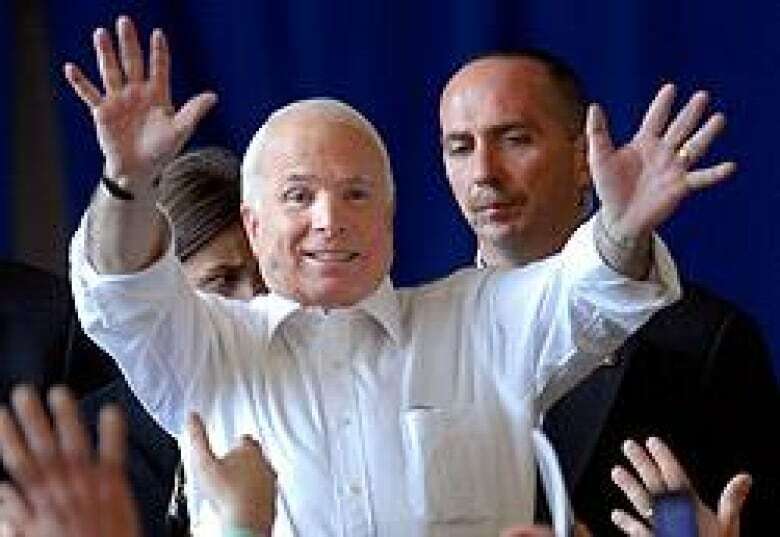 Republican presidential candidate John McCain, shown at a campaign rally Friday in Blaine, Minn., said the Federal Reserve should do more to shore up the U.S. dollar. ((Janet Hostetter/Associated Press))McCain, however, said he would establish a new federal agency to address future financial woes. The Arizona senator described his proposed mortgage and financial institutions trust as an intervention system that would work to prevent bailouts and bankruptcies and as part of a move to put the U.S. Treasury in a "proactive" position. The agency would work with the private sector to identify weak institutions and help them before they are in need of government assistance, he said. In an oft-repeated criticism, he railed against lobbyists, politicians and bureaucrats for contributing to a "culture of lobbying and influence-peddling" that caused the sub-prime mortgage crisis. Then, taking a swipe at the Bush administration, he blamed government complacency for allowing the irresponsible lending practices by financial institutions such as Freddie Mac and Fannie Mae, which he said were at the root of Wall Street's current troubles. McCain's comments came a day after he called for the dismissal of Chris Cox, head of the Securities and Exchanges Commission, the U.S. federal financial markets regulator. Obama echoed McCain's call for changing the market regulatory system currently in place in the United States. "I am glad to see Senator McCain agrees with not just me but also Secretary Paulson and [Federal Reserve Chairman Ben] Bernanke that at some point, we're going to need some sort of institutional structure to deal with the underlying problem of bad mortgages." While Obama refrained from criticizing McCain's views, the Arizona senator was highly critical of his rival's actions with regard to the credit crisis. "The financial crisis that we are living through today started with the corruption and manipulation of our home-mortgage system," McCain said. "Two years ago, I called for reform of this corruption at Fanny Mae and Freddie Mac. Congress did nothing. The administration did nothing. Senator Obama did nothing." Democratic presidential candidate Barack Obama had received large campaign contributions from Fannie Mae, McCain said, and therefore "profited" from the system. McCain himself has received about a sixth of the amount from the two mortgage companies. He also criticized Obama for appointing former Fannie Mae CEO James Johnson as the co-head of his vice-presidential search committee. "Now we've heard a lot of words from Senator Obama over the course of this campaign, but maybe just this once he could spare us the lectures and admit to his own poor judgment in contributing to these problems."